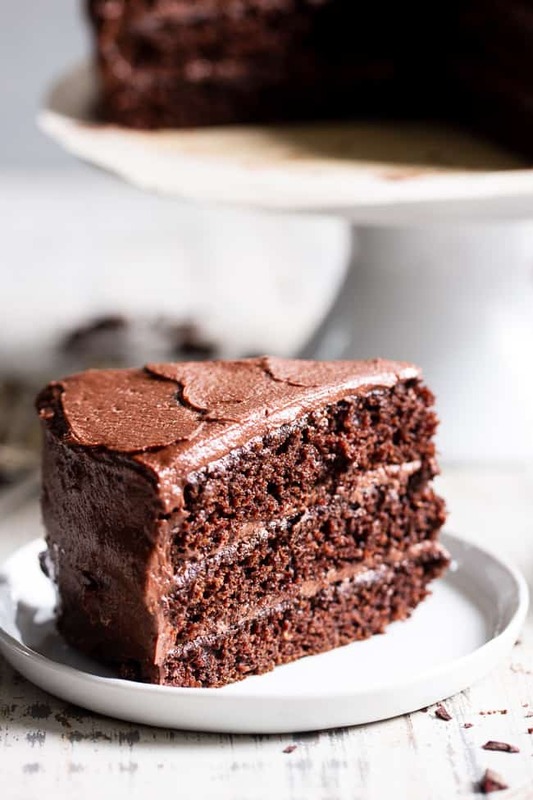 This rich, decadent, moist and tender paleo chocolate cake is made healthier with a blend of grain free flours, organic coconut oil and unrefined coconut sugar. The dairy-free “buttercream” frosting is out of this world delicious and NONE of it tastes paleo, even though it totally is! Guess what?! My birthday is tomorrow! Each year for my birthday, I make sure to post an extra-special recipe on the blog. 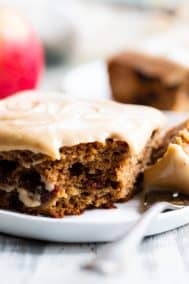 So, last year it was my maple pecan banana bread breakfast bake (not a cake, but special, trust me!). The year before that it was my beloved chocolate chip skillet cookies! That recipe remains one of my favorites on the blog, in truth. In fact, I love it so much that I can’t help but make it for basically every gathering that requires a dessert! But this year? 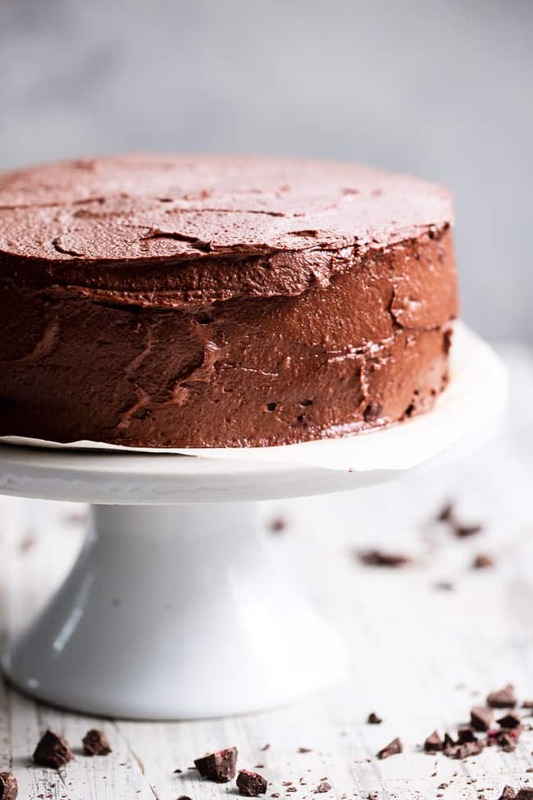 We’re going all out with a paleo chocolate cake! 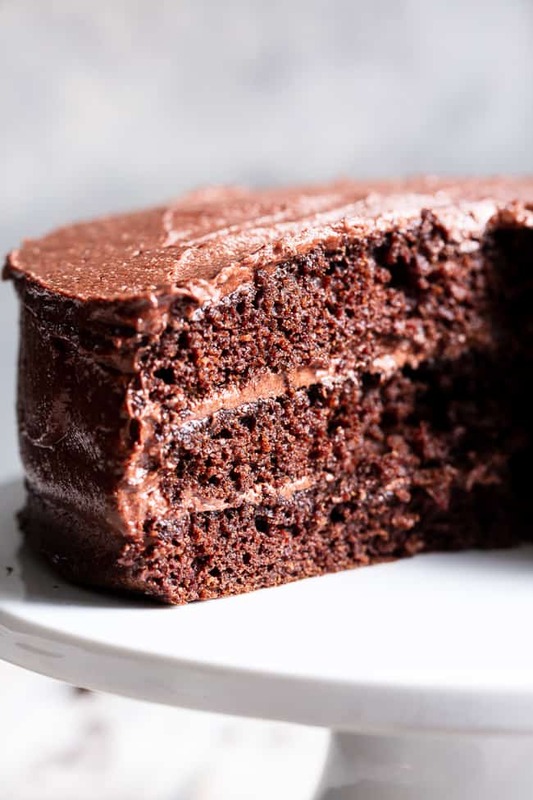 Complete with an incredible dairy-free chocolate buttercream. A buttercream that will probably make you utter that famous phrase (I can’t believe it’s not…buttercream). There it is – perfection! Rich and sweet, creamy, easy to spread and doesn’t melt. Score! I used a combination of palm oil shortening, coconut oil, raw cacao powder and homemade paleo powdered sugar. If you haven’t made paleo powdered sugar yet, no worries. You simply blend coconut sugar with a bit of tapioca until it reaches a powdery consistency – done! 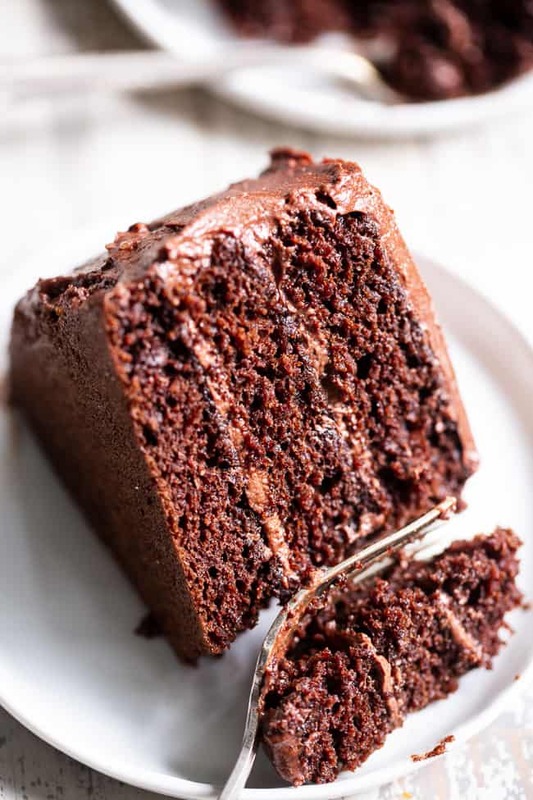 However, if you’re okay with cane sugar in this recipe, you can also use organic powdered sugar to make the frosting. As for the cake itself, it’s very easy to make – nothing intimidating here! The batter is a combination of blanched almond flour, tapioca, and raw cacao, with dairy-free milk, eggs, coconut oil, and coconut sugar. The size/shape of the cake you make is up to you. I chose to make this as an 8″ 3 layer cake, but you can also make it a 9″ 2 layer cake with no issue. 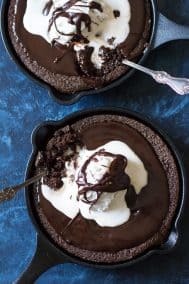 Additionally, you can make this recipe into a sheet pan cake or cupcakes for that matter – just make sure to check for doneness and adjust the baking times depending on what you’re making. 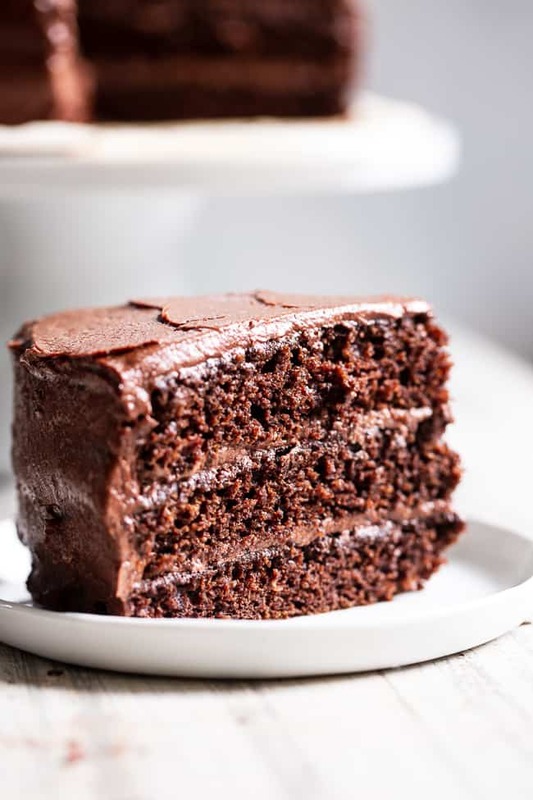 My family was completely obsessed with this paleo chocolate cake with the first bite – no joke here. Furthermore, even my picky chocolate-hating son (crazy, I know) somehow liked this cake! 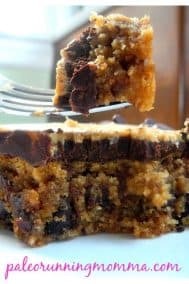 The texture is moist and dense but not overly so, and it’s rich yet not too sweet. It’s obviously perfect for birthdays but also an awesome cake to serve for just about any gathering! 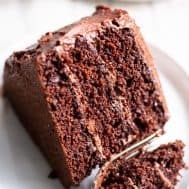 People won’t know this one is paleo – it’s just a good classic homemade chocolate cake in every way. Back to my birthday! How do we feel about birthdays? I’ve always been torn about the whole30 “celebration” part of birthdays for myself. I think after the age of 10 it started to feel strange for me to make a big deal about my birthday, even though a part of me wants to. Maybe it’s that nagging feeling about being the center of attention, or rather, asking to be the center of attention, and receiving rather than giving. The whole attention/receiving thing definitely feels uncomfortable for me, I believe that’s the problem. It’s something I’m working on – and getting better at, I think! Because why shouldn’t each of us have one day out of the year to be the center of attention and receive, instead of give? I hope you’re ready for something delicious – grab an apron (chocolate is messy!) 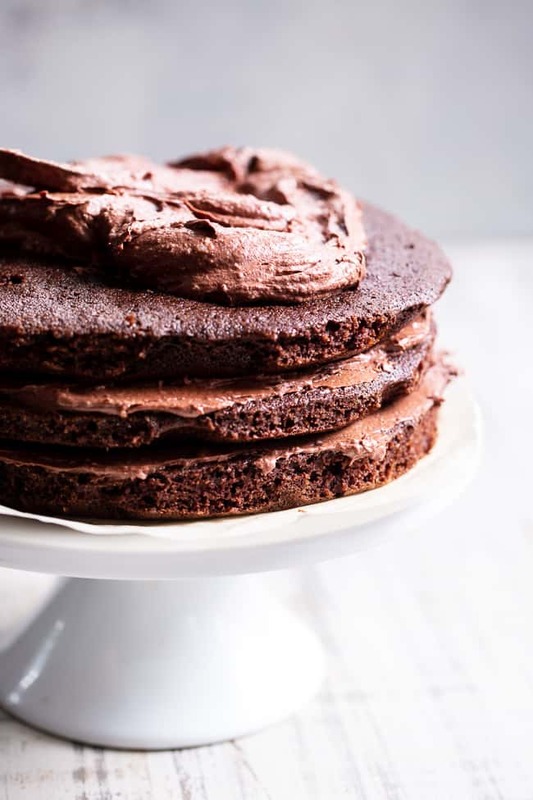 and let’s celebrate with the best (healthier) paleo chocolate cake! 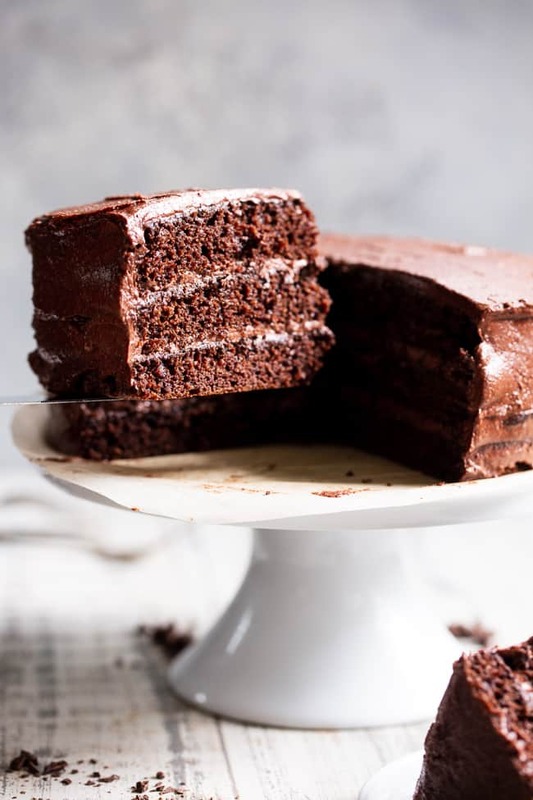 This rich, decadent paleo chocolate cake is made healthier with a blend of grain free flours, organic coconut oil and unrefined coconut sugar. The dairy-free “buttercream” frosting is out of this world delicious and NONE of it tastes paleo, even though it totally is! Prepare the cake first. You can make this cake in 3 8” layers (what I did) or 2 9” layers. Baking times will vary slightly, so watch for doneness. Preheat your oven to 350 degrees and line your cake pans with parchment OR grease lightly with coconut oil. 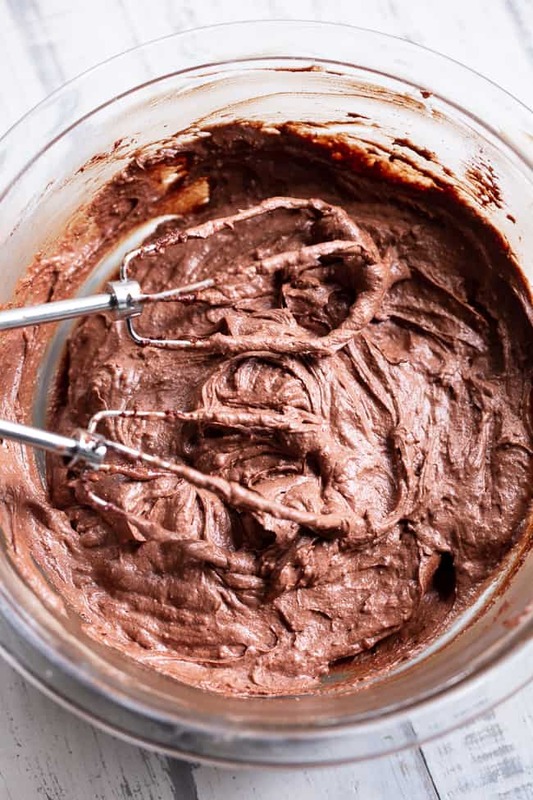 In one mixing bowl, combine the almond flour, tapioca, cacao or cocoa powder, baking soda and salt, then set aside. In a separate large bowl, whisk together the eggs, almond milk, coconut sugar, and coconut oil until very smooth. Immediately stir in the dry mixture and stir well (you can also use an electric beater) until a smooth batter forms. Bake 15-25 minutes depending on your cake pans - cake is done once the center is set and a toothpick inserted near the center of one layer comes out clean. Cool cake layers on wired racks while you prepare the frosting. Use an electric hand mixer or stand mixer to beat together the shortening and coconut oil until mostly smooth and fluffy. Add in the powdered sugar of choice and cacao or cocoa powder and continue to beat, then add 2 Tbsp of the milk and continue beating. Add in the vanilla and the last Tbsp milk slowly to reach the desired consistency. To make the cake easier to frost, chill the layers first, OR use this “crumb layer” method. Frosting will be creamy at room temp and harden quickly when chilled, however, you can easily re-beat it to a creamy consistency if you’d like to store it in the fridge. Place the first layer carefully on a cake stand, turntable, or plate. Using an offset spatula or butter knife, frost the top of the first layer, then place second layer on top and repeat. Repeat with the third layer and frost around the outside of the cake as desired. *To make powdered sugar with coconut sugar, place 2 cups coconut sugar with 2 Tbsp tapioca or arrowroot flour in a food processor and blend/pulse until you get a powdery consistency. Use 1 cup of this mixture for the frosting recipe. **I like the texture using both coconut oil and palm shortening, but if you’d rather not use both, palm oil shortening alone will work. Do not use coconut oil alone. WOW this cake looks AMAZING! Perfect for birthdays! What would you use as an alternative? Can I use flax eggs instead of regular eggs? wow, this just looks so good! I have to be egg free. Do you think this will work with chia or flax egg? Happy Birthday! What a lovely cake, this one will definitely be at the top of my chocolate cake list. Simple yet decadent, who wouldn’t live that? Hope you have a wonderful day. Happy Birthday, Michele! This birthday cake looks like the perfect cake to celebrate with! Can I use grass fed butter instead of palm oil shortening? If so, would it be the same measurement? Made this last night and it was a hit! I love the fact it is dairy free and gluten free. I snuck a taste of the frosting and I just knew it would be a win. I recently found your website- and I have already enjoyed the quiche and now the chocolate cake. Happy Belated Birthday!!! Thank you!!! I made this tonight and it came out amazing! Took exactly 15 min in my oven. I needed a little extra Almond Milk for my frosting. Overall both the cake and frosting were phenomenal and the recipe was easy! I just made this, actually eating a piece at the moment, and it is wonderful! Just wondering how to store it? Counter or fridge? Also, I think you left off the vanilla in the cake instructions..
Any ways…thank you for the recipe. I haven’t had chocolate cake since going gluten free over a year ago!! What can be subbed for the palm oil shortening ? I would like to make this for my birthday tomorrow. I made traditional buttercream frosting, not the recipe’s, but I’m sure it’s equally delicious. Hello. Looking forward to making this cake. Wondering… can you make ahead and store/freeze? Suggested cooking time as cupcakes? I want to make this for my daughters birthday this weekend. Thank you!